When using airport parking please make sure you have directions to your car park, the car park telephone number, and details of the entry and exit procedures for the car park. Directions are included on the customer confirmations. Directions and maps serve as a guide only. We recommend you use them in conjunction with an up-to-date road atlas. Your voucher is only valid in the car park you have booked. Should you park elsewhere you will be charged locally and Airport Car Parking (Northern) Ltd in conjunction with Holidayextras will not reimburse you. Entry and Exit procedures vary at each car park. Please see information on your confirmation. If you are charged by the car park because you do not follow the correct entry or exit procedures or present your confirmation voucher, Airport Car Parking (Northern) Ltd may not be able to obtain refunds on your behalf. 24 hour transfers to and from the airport are included in the price, unless the airport is within walking distance or not operational 24 hours. Please make sure you have the transfer schedule for your car park and that the times of operation suit your requirements. Minimum stays and charges apply at some car parks. If you wish to stay for fewer days, you may, but the cost of the minimum duration is payable. This is made clear during the booking process. Daily prices may vary according to the date and length of stay. Stays of fewer than 8 days may attract a higher daily rate. In the interests of efficient operation you must be prepared to leave your car keys with car park staff if requested to do so. Where disabled facilities are provided, please ensure these are suitable for your individual needs. All parking is subject to the terms and conditions of the individual car park these are available on request from the car park. Ensure no valuables are left in the vehicle, as Airport Car Parking (Northern) Ltd will not accept liability. Parking is always at the vehicle owner's risk. Not all car parks can accommodate high side or large vehicles due to there own policies or height restrictions. If the car park can accommodate larger vehicles there may be an extra charge. Please check before booking. If you have booked this special service, (where you are met at the terminal by a driver who takes your car away to secured storage for you), you may need to reconfirm your booking direct with the parking operator prior to your date of travel, giving your booking reference. Supplements may be charged for service outside normal hours and on all public and bank holidays payable directly to the parking operator. Our Standard Terms and Conditions apply to Hotel Bookings. Other conditions that apply specifically to our hotel bookings are listed on this page. All hotel star ratings are our own ratings. When giving our rating we consider feedback we have received from our customers and from our own regular visits to the hotels. We also assess the suitability of the hotel for the purpose it is being used for. Our ratings will not always be the same as other nationally recognised schemes. Directions and contact details: Please make sure you have directions to your airport hotel and the hotel's telephone number. This information is included on your customer confirmation. We recommend you use them in conjunction with an up-to-date road atlas. Transfers: Transfers to and from the airport are included in the price within scheduled times (not always 24hrs), unless otherwise stated. Please check the transfer details when you get your confirmation to ensure they are suitable for your flight times. Port Hotels and London Hotels do not include any transfers. Disabled facilities: Where special facilities are provided, transfer and parking arrangements may not be suitable and rooms are available on a request basis only. Overnight parking for customers booking room only: Check the parking details when booking as not all hotels allow free overnight parking. Standard rooms: Facilities differ at each hotel, please ensure the room you are booking has the facilities you require before confirming your booking. Breakfast: Your confirmation will tell you if breakfast is included in the reservation. Where breakfast is included please check the times it is. No refund is given for unused Breakfast. Leisure facilities: Where hotels have leisure facilities there may be charges levied and restrictions put on child access. If you want to use the facilities check the detail before confirming your booking. Wake-up calls: As hotels do not take responsibility for alarm calls we suggest you take a travel alarm. If you miss a flight the hotel will not accept responsibility. No refund is made for cancellation of hotel bookings within 24 hours of the stay date or afterwards. An administration fee of £15 per room per night applies to all other hotel cancellations and to amendments where the result is a reduction in the number of rooms or nights originally booked. The terms and conditions are set out and applied by Holidayextras who operate the search engine. 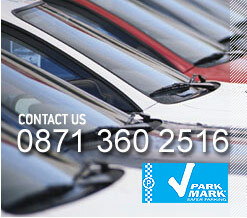 All customers remain the customers of Airport Car Parking (Northern) Ltd.